As the leader of his people, Evo Morales celebrates his 50th birthday on Monday, having become one of the most prestigious leaders in the world. Regarding the date, he said, "That means that I’m a militia member, too"
The first time we talked with Evo Morales, on a cold winter night in La Paz in 2008, after learning the date of his birthday, one of us observed, "On that same day, Fidel in Havana called upon the people to create the National Revolutionary Militias." The Bolivian president nodded his head and after a brief silence commented, "That means that I’m a militia member, too." Fifty years after having been born on October 26, 1959, Evo will most likely arrive at his birthday involved in one of his usual busy days. He will rise at 4 a.m., see to the first matters one hour later, and immerse himself in a whirlwind of work that will continue until late at night. He might travel to somewhere in the country to inaugurate a construction project, supervise a program, converse with residents, correct perspectives, right some wrongs, and envision new possibilities for his people. 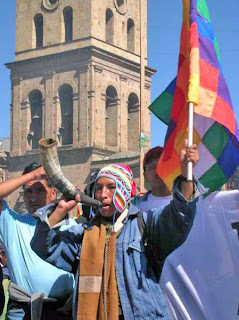 Since January 2006, Evo has been president of all the Bolivian people. He assumed office with more than 53% of the vote, which was ratified in an August 2008 referendum by an overwhelming majority. In the upcoming December 6 elections, the first to be held under the country’s new Constitution, no other candidate has appeared that could displace him. What speaks for Evo is unprecedented progress in the country’s history in terms of social justice, productive incentives, education and health. There is the recovered dignity of a people that finally has the benefits of the exploitation of hydrocarbon and mineral resources. And the dignity of the descendants of the indigenous peoples — Aymara, Quechua, Guaraní and another 30 indigenous communities — who, under his government, have gone from being invisible and denied for so long to playing a central role in a heroic collective effort. "At this point I do not see a figure other than Evo who is consistent and serious. Because the only program that the rightists have is to go backwards. There is no other program except to get the United States to accept us; to have the DEA attack the coca farmers again; that nationalization is good in theory but why nationalize if you don’t have capital; to hand over our national resources to the lowest bidder, and other old ideas. The opposition has been left without arguments. They cannot tell people that they are going to continue to bring changes, and the people are convinced that the road forward is change, and that the only one who can do it is Evo Morales." "When considering one’s main enemy, one should be cautious in knowing that such an enemy does not have the virtue of political transparency; rather, he has the shrewdness to not present himself as the main enemy and to use third parties. I would say that our adversaries are digestible, politically speaking, because they are incapable of producing an alternative project to the one we have. They are adversaries ashamed of their reality; they have no identity; they lack their own doctrine. Their proposals are more the result of external lucubration; they have a script to follow. Therefore, they don’t worry us much. What worry us are the main enemies of this revolution: at some point they were the transnational corporations, until we struck a blow at them one day. Later, they dispersed out into pro-secession political projects and dropped anchor there. Today, they act in the shadows, but we know they are putting together their conspiracy. Of course, they are using every imaginable method to undermine this process, and of course, they have gone from the coup-plotting adventure to the separatist terrorist adventure. I would warn that they could end up in a suicidal adventure." Evo received a magnificent birthday present shortly before the ALBA Summit held last weekend in Cochabamba. Compañero Fidel’s Reflection entitled "A Nobel Prize for Evo" offered readers in Cuba and around the world a very precise profile of the merits of the Bolivian leader. "It was at an event in Havana in 1992," he told us. "With the help of various friends, I managed to get together the money for the one-way ticket to Havana. I only went to Havana to learn about Cuba and Fidel. I made a three minute speech, Fidel was chairing the meeting. I didn’t get to meet him personally but afterwards, I found out that he had noticed me. The return journey was very complicated. They managed to get me a ticket as far as Lima. I got there with just a dollar in my pocket which I changed into soles. Luckily, a Peruvian friend Juan Rojas, lent me $100 so that I could make it back to Bolivia." "I’ve had several meetings with Fidel. He is a wise older brother, whose basic principal is solidarity and the struggle for dignity and justice. Fidel is the best doctor in the world. You should see how concerned he is over the health of others, but he is also a great teacher. I feel that Fidel is the Commander of the libertarian forces of America." The day that Evo was elected leader of his trade union in the coca plantations in Chapare – prior to that he was secretary of sports and then, and to date, president of the six trade union federations in the Trópico de Cochabamba – he didn’t even have enough money to reach the meeting in Villa Tunari by bus. "I went by bicycle," he tells us. "It was several kilometers away. I went pedaling away and thinking at the same time. Ideas spring to mind when you’re out in the open air. I would think about how the world could not continue in this way, just a few ‘haves’ and the vast majority, ‘have-nots.’ It came to me clearly that the fight must be an anti-imperialist one." In the international arena, Evo has consolidated notable prestige for his unambiguous positions and his ethical stance on defending the dispossessed and Mother Earth. He has even merited the evaluations of politicians who are diametrically opposed to his way of thinking, such as the case of former U.S. President William Clinton. According to a report by EFE dated May 16, 2006, Clinton was asked during a press conference in New York what he thought of the nationalization of the hydrocarbons industry and the situation in the South American country. Clinton likewise responded with a question: "What would you do if you were a Bolivian miner working 60 hours a week, with four children to feed and no prospects for improvement? Who would you have voted for?" "I see Evo as stronger than ever, clearer than ever, a greater leader than ever. Support him, don’t listen to the voices of the oligarchy, who are trying to demonize him and confuse the people every single day. (…) Come together with love, and design and build together the great Bolivia of the 21st century." Many things in this world amaze Evo. For him, the most important values are openness, honesty, honor and respect for the elderly. He cannot abide vanity or dishonesty. He likes to hear different people’s opinions before making a decision. He confided to us that he would only make one personal request of Cuba: "That Silvio comes here to sing." This is a great article. I really believe that Evo Morales is the best president Bolivia ever had. He is honest, intelligent and hardworking. He truly loves his people. We need to support him every day. You have done a tremendous job hope you will win the next election and see the whole programme through.You will have to address the Money Supply question to eliminate inflation.With no disrespect none of the progressive governments are doing this. Unless this is urgently tackled the progress you all are making will be derailed.Possibly they may not be aware how this can be done. Please do not accept the Noble Price it's as fraudulent as the banking system. Gandhi refused to have anything with it.As a committed pacifist I understood that.